Background/Aims: Middle Eastern countries, including Saudi Arabia to some extent, are endemic for chronic hepatitis B (CHB) infection which could be associated with high mortality and comorbidities risk. However, limited data characterizing this CHB population exists. Our aim was to characterize and compare CHB patients in 2015 with those in 2010 and 2012 in Saudi Arabia. Patients and Methods: We conducted and compared three cross-sectional analyses of adult patients with CHB defined as either positive hepatitis B surface antigen or documented CHB history in 2010, 2012, and 2015. Data were accessed from the multicenter Systematic Observatory Liver Disease Registry (SOLID). Results: A total of 765 CHB patients were identified in 2010 (n = 274), 2012 (n = 256), and 2015 (n = 235). Median age was significantly higher in 2015 (47 years) compared to 2010 and 2012 (42 years;P < 0.05). The proportions of patients with hepatocellular carcinoma (range 1–12%) and cirrhosis (range 5–23%) were significantly higher in 2015 compared to 2010 and 2012 (P < 0.05). Compared to 2010, patients in 2015 had significantly (P < 0.05) higher prevalence of coronary artery disease (10% vs. 4%) and hyperbilirubinemia (18% vs. 9%). Although not significant, there was a numerical increase in 2015 in chronic kidney disease (9% vs. 7% in 2010;P= 0.559) and hepatic steatosis (32% vs. 25% in 2010;P= 0.074). Significantly more patients in 2015 (P < 0.05) were treatment experienced (23% vs. 5% in 2010/2012) and switched treatment (17% vs. 1–2% in 2010/2012). Conclusions: Between 2010 and 2015, the CHB population in Saudi Arabia had significantly aged and was more likely to develop liver disease sequelae and other comorbidities. The hepatitis B virus (HBV) is a small, partially double-stranded DNA virus often transmitted by exposure to infectious blood or bodily fluids. The diagnosis of HBV infection and its associated disease is often based on a constellation of clinical, biochemical, histological and serological findings. Patients with chronic hepatitis B (CHB) are at an increased risk of developing liver-related complications, including cirrhosis, hepatic decompensation and hepatocellular carcinoma (HCC). Approximately, 257 million people have CHB globally, with 887,000 deaths from HBV-related cirrhosis or HCC in 2015. In the Middle East, Saudi Arabia and Jordan are classified as highly endemic for CHB by the World Health Organization (WHO), while Turkey and Pakistan are classified as having intermediate endemicity. Evaluation studies of the HBV vaccine program implemented in 1989 in Saudi Arabia showed that the vaccine was highly efficacious and was associated with a marked decline of HBV infection in Saudi Arabia.,, The prevalence of HBV infection in Saudi Arabia has been assessed in several studies among blood donors based on hepatitis B surface antigen (HBsAg) positivity, with values ranging from 1.5 to 2.6%.,, However, the HBsAg prevalence in the Saudi population greater than 40 years of age was estimated to fall in the 3–6% range. There are currently no large epidemiological or health economic studies that accurately estimate the burden of CHB in the Middle East, however, the burden of disease is considered high based on clinical observation and deaths from CHB complications. Given the nature of disease progression, the primary goals of CHB treatment are sustained viral suppression, normalization of alanine aminotransferase (ALT), and prevention of the development and progression of the HBV-related liver disease. Treatment guidelines for the management of CHB in Middle Eastern countries are often developed based on existing international guidelines.,,, Commonly recommended antiviral agents as first-line treatment of CHB in Saudi Arabia include the nucleo(s) tide analogs (NAs), tenofovir disoproxil fumarate (TDF) and entecavir (ETV) in treatment naïve patients. Results from a recent study using United States (USA) administrative healthcare claims between 2005 and 2016 suggest that CHB patients are getting older and thus their overall health profile, including the prevalence of non-liver-related comorbidities are increasing. Although previous studies have aimed to characterize the age, prevalence of comorbidities, and concomitant medications among CHB patients in the USA, limited evidence is available in the Middle East. Therefore, further studies are required to fully characterize the CHB population to ensure adequate management of comorbidities and appropriate treatment planning. The objective of the current study was to characterize and compare CHB patients in 2015 with those in 2010 and 2012 in Saudi Arabia in terms of baseline demographics, liver and non-liver-related comorbidities, concomitant medications and CHB-related treatment patterns. The current study performed three cross-sectional analyses using data from the Systematic Observatory Liver Disease Registry (SOLID), which was provided by the Liver Disease Research Center of the King Saud University Medical City. The SOLID project is a multicenter, observational, open-label group of medical registries that uses annual cross-sectional surveys to capture liver disease outcomes from Saudi patients who visited five centers, including the King Abdulaziz Medical City at Jeddah and Riyadh; King Fahd Hospital of the University, AlKhobar; King Saud University Medical City, Riyadh; King Fahad Hospital, Jeddah in Saudi Arabia between 2010 and 2016. Each participating center's institutional review board approved the SOLID registry project. Since the data are collected from medical charts using unidentified patient's individual patient informed consent was waived. 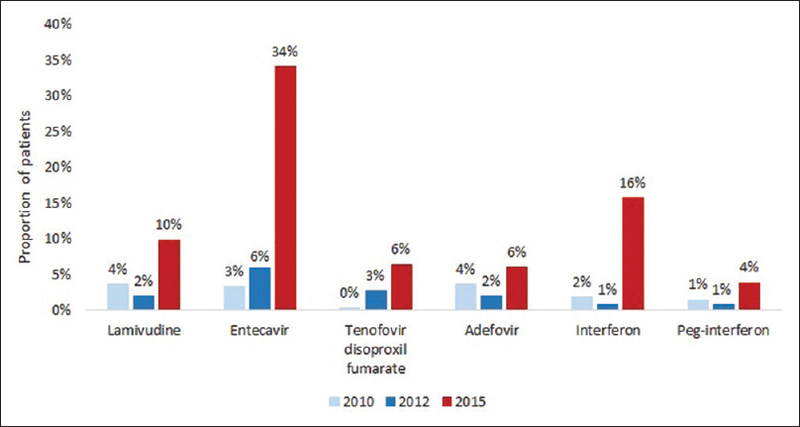 Data for the current study were extracted for all patients diagnosed with HBV infection in 2010, 2012 and 2015 as these years contained the largest number of HBV patients available. Patients were included in the study if they were 18 years of age or older. Various criteria were used to determine CHB status (detectable serum HBsAg >6 months), including serum HBV DNA, hepatitis B e-antigen (HBeAg), and ALT levels. The data included were not longitudinal, wherein each year was associated with different patients. The outcomes of interest for the current study included socio-demographic characteristics, the prevalence of liver- and non-liver-related comorbidities, concomitant medication use and treatment patterns. Treatment exposure was defined as either a previous exposure to treatment or a current exposure which started prior to clinical admission. Treatment switch was defined as a patient currently receiving an HBV treatment that was different than previously reported treatments. Patients were defined as treatment experienced if they received at least one prior HBV treatment other than the current one. Descriptive statistics were summarized as the mean ± standard deviation (SD) for continuous variables, while categorical variables were described using percentage and number of subjects in each category. Statistical tests, including the Chi-square test for categorical variables and the Student's t-test or Wilcoxon's test (selection based on the normality test) for continuous variables, were conducted to assess differences for each outcome. All results were presented as a comparison to the year 2015 and were considered statistically significant if the P value was <0.05. All statistical analyses were performed using the SAS version 9.4 (SAS Institute Inc., Cary, NC, USA). A total of 766 patients were reported in the SOLID registry. All patients but one (non-adult patient) met the inclusion criteria for the current study across years 2010 (n = 274), 2012 (n = 256) and 2015 (n = 235). Socio-demographic characteristics of the included patients are shown in [Table 1]. The majority of patients were male regardless of the year of analysis with proportions ranging from 60.0% male in 2015 to 63.3% in 2012 (P = 0.546). Patients were significantly older in 2015 (46.9 ± 14.3 years) compared to 2010 (42.0 ± 13.4 years, P < 0.001) and 2012 (42.4 ± 13.7 years, P < 0.001), with a higher proportion of patients > 60 years in 2015 (21.3%) compared to both 2010 (10.9%) and 2012 (12.9%). No significant differences were observed for the height or weight of included patients, however, the body mass index of patients in 2010 was significantly lower than patients in 2015 (P = 0.045) [Table 1]. The proportion of patients with liver- and non-liver-related comorbidities is shown in [Figure 1]. The proportion of patients with cirrhosis in 2015 (22.6%) was significantly higher than both 2010 (5.5%, P < 0.001) and 2012 (6.3%, P < 0.001). Similarly, the frequencies of HCC (P < 0.001), hyperbilirubinemia (P = 0.006 and P= 0.028 compared with 2010 and 2012, respectively), and kidney and/or liver transplant (P = 0.016 and P= 0.002 compared with 2010 and 2012, respectively) were significantly higher in 2015 compared to both 2010 and 2012. The proportion of patients with HCC was 11.9% in 2015, compared to 0.7% in 2010 and 0.8% in 2012 (both P < 0.001) while that with hyperbilirubinemia was 17.9% in 2015, compared to 9.5% in 2010 (P = 0.006) and 10.9% in 2012 (P = 0.028). Lastly, patients with kidney and/or liver transplant were 3.8% in 2015, compared to 0.7% in 2010 and 0% in 2012 (both P < 0.05). The frequency of CAD was significantly higher in 2015 vs. 2010 (10.2% vs. 4.0%, P= 0.006). No statistically significant differences were observed in the frequency of CAD between 2015 and 2012 (P = 0.006 and P= 0.074 compared with 2010 and 2012, respectively) or hepatic steatosis (P = 0.074 and P= 0.942 compared with 2010 and 2012, respectively) among CHB patients in 2010 or 2012 compared to 2015. The proportion of patients with comorbid CKD, as measured by both MDRD-GFR and Cockcroft-Gault, is shown in [Figure 2]. There was a trend towards increased prevalence of CKD in 2015 CHB patients (6.8–8.5%) compared to both 2010 (6.2–6.6%, P= 0.964 and P= 0.560) and 2012 (5.1–5.5%, P= 0.592 and P= 0.304). The treatment pattern of CHB patients in terms of treatment experience and switch is shown in [Figure 3]. More patients in 2015 were treatment experienced (22.6%) compared to both 2010 and 2012 (both 5.1%, P < 0.001). 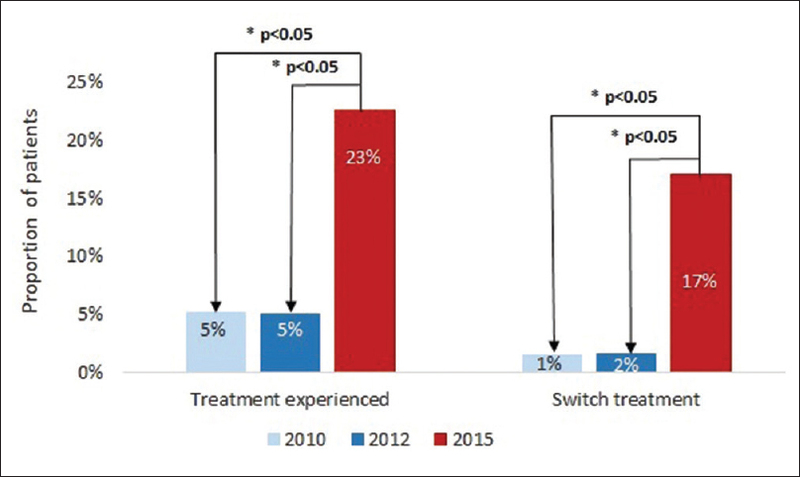 Similarly, significantly more patients had switched treatments in 2015 (17.0%) compared to 2010 (1.5%, P= 0.021) and 2012 (1.6%, P= 0.025). The proportion of patients either previously or currently receiving treatment at the time of analysis is shown in [Figure 4], as per type of therapy. The proportion of patients receiving ETV was 34.0% for patients in 2015, compared to 3.3% in 2010 and 5.9% in 2012. Patients in 2015 were also more likely to have received lamivudine, TDF and interferon than in 2010 and 2012, with proportions of 9.8%, 6.4% and 15.7%, respectively. Additionally, the overall mean duration on treatment was numerically higher in 2015 compared to 2010 and 2012, although statistical significance was not observed (data not shown). Saudi CHB patients have aged significantly between 2010 and 2015 with more patients >60 years of age in 2015 compared to both 2010 and 2012. More importantly, the CHB population in 2015 had a higher proportion of patients with comorbidities, such as cirrhosis, HCC, or CAD, and have either switched treatment or been treatment-experienced. 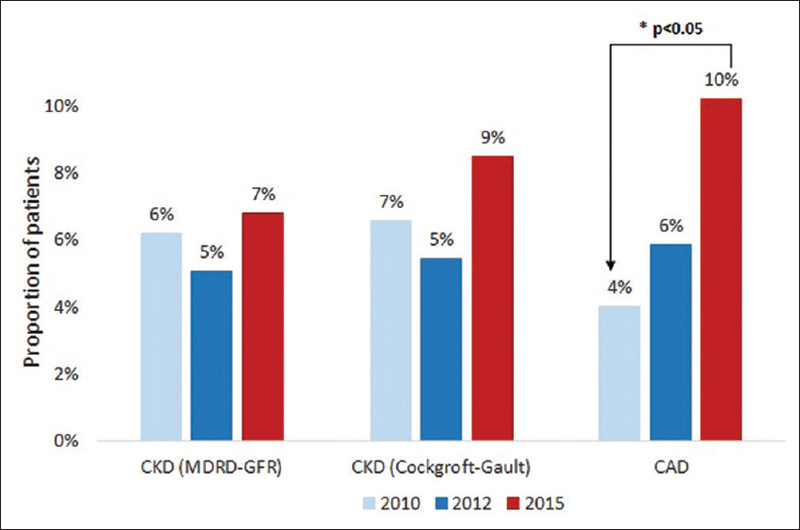 There was also a trend towards higher CKD prevalence among 2015 CHB patients (7–9%) compared to both 2010 and 2012. This result is also higher than the prevalence of CKD observed among the general population in Saudi Arabia in 2010 from a previous study (<6%). The results of the current study are consistent with previously published observations in the United States CHB patients demonstrating an incremental prevalence of CHB-associated and non-associated comorbidities with increasing age. The proportion of CHB patients with diabetes and cardiovascular risk factors, such as hypertension and hyperlipidemia, increased significantly between 2006 and 2015 in USA. These results have potential implications for the management of disease and treatment patterns in aging patients with existing comorbidities. The current preferred NA treatment regimens by the European Association for the Study of the Liver (EASL) are ETV, TDF and tenofovir alafenamide (TAF) as monotherapies. However, due to their more attractive safety profile, TAF or ETV may be preferred treatment options in older patients with comorbidities, including patients with decompensated disease and kidney dysfunction. Overall the data show that patients are more likely to be on treatment as time progresses. This shows an encouraging trend that CHB patients are being treated, but there is still a need for increased screening and linkage-to-care as a large proportion of CHB patients remain untreated. In the general population, the likelihood of developing chronic disease and comorbidities also increases, proportional to life expectancy. The main chronic diseases include, but are not limited to, ischemic cardiovascular disease, cerebrovascular disease, diabetes, cancer and depression. A previous hospital-based study showed an increasing prevalence of non-alcoholic fatty liver disease (NAFLD) in Saudi Arabia, from mild steatosis to non-alcoholic steatohepatitis (NASH). Based on a model of disease burden in Saudi Arabia, the prevalence of NAFLD was estimated to be 25.7% in 2017 and 31.7% by 2030; the prevalence of NASH was estimated to be 4.2% in 2017 and 6.8% by 2030. The relatively large increase in NASH prevalence is primarily due to aging of the population and disease progression. High rates of adult obesity, type 2 diabetes mellitus and an aging population are expected to be associated with an increase in advanced liver disease and mortality due to NAFLD or NASH. The increase in advanced liver disease prevalence may also be associated with a higher rate of detection, which in turn may be related to greater use of non-invasive tools for the diagnosis of liver diseases, particularly in patients with hepatitis B. Several publications showed the effective diagnostic performance of non-invasive tools, such as transient elastography (TE), in predicting the stage of fibrosis in patients with chronic viral hepatitis., Moreover, a previously published study on a community-based population aged 45 years or older found that liver stiffness measurement was useful to detect chronic liver disease, such as NAFLD or alcoholic liver disease, in patients without known liver disease. Numerous robust non-invasive tools have been recently developed leading to a reduced need for invasive liver biopsy, which has resulted in risk diminution, lower costs and better patients' acceptance. An increasing reliance on such non-invasive tests in CHB patients is not limited to TE, as demonstrated by recent studies highlighting the role of fibrosis identification and disease monitoring by combination biomarkers or quantitative HBsAg levels. Such measures may further boost the pool of patients identified with significant fibrosis and “occult” cirrhosis, thereby bringing an ever-increasing cohort of previously unrecognized and mischaracterized patients into treatment eligibility. Advancing age and associated comorbidity profiles of CHB patients should be considered in disease management. Polypharmacy may sometimes be necessary, but can be associated with an increased risk of adverse outcomes, such as non-adherence, adverse events, and contraindicated drug combinations. Non-adherence is a key issue for patients with CHB as the effectiveness of anti-HBV treatments and virological suppression are associated with adherence, which is a major determinant of liver disease progression and mortality. Nonetheless, if compliance to treatment is preserved, more than 95% of patients treated with the newer, orally administered, highly potent NAs TDF and ETV achieve virologic remission. The current study had several limitations, primarily related to data availability. Due to the design of the SOLID project, which compiled data from annual cross-sectional surveys, the current study performed three separate cross-sectional analyses. Ideally, the study would have been a longitudinal analysis where the same patients were followed over time to assess the evolution of the CHB population. Other limitations to the current study include the small sample size of CHB patients at each of the three selected time points, especially compared to previous studies. Additionally, our insight into the evolution of CHB in Saudi Arabia would be incomplete without a robust discussion on confounding factors that may account for the greater prevalence of liver diseases sequelae in more recent years. For instance, a more liberal and widespread usage of TE within the country has allowed for the diagnosis of “occult” cirrhosis with increasing frequency. An accelerated incidence of NASH within the population, as recently reported, may also have accounted for a greater prevalence of liver-related morbidity, compounding the effect, and complicating the natural history of CHB. This is evident by the higher body mass index of patients in 2015 as compared to those in earlier years as shown in our study. Moreover, the same comorbid states that account for NASH could also potentially account for greater prevalence of CKD and CAD. Finally, it is worthy to note that the CHB patients included in the current study may not be generalizable to either the entire Saudi Arabian population or the Middle East as a whole. To conclude, this observational retrospective study reported that CHB patients in Saudi Arabia were older in 2015 compared to 2010 and 2012. These patients were also more likely to develop comorbidities, including cirrhosis, HCC and CAD, and to have been treatment experienced or undergone treatment switch. This knowledge offers further impetus to the case to intensively screen, identify, and offer early treatment to the HBV-infected population in Saudi Arabia. Further research is required to better characterize the CHB population in endemic areas, including the Middle East, to ensure appropriate management of the disease. This study was funded by Gilead Sciences Inc.
Dr. Sanai advises, is on the speakers' bureau of, and received grants from the Bristol-Myers Squibb, Gilead Sciences and AbbVie Pharmaceuticals. He is a consultant for and on the speakers' bureau of the Merck Sharp Dohme, Gilead Sciences, Roche Pharmaceuticals and Janssen Pharmaceuticals. Alghamdi, K. Alswat, M. Babatin, M. Ismail, W. Alhamoudi, A. Alalwan, Y. Dahlan, A. Alghamdi, F. Alfaleh, A. Aljumah, I. Altraif, K. Albeladi, W. Alshumrani, F. Batwa and A. Abdo report no conflict of interest. D. Belhadi and V. Genestier work for the Amaris Company and report no conflict of interest. Hollinger FB, Liang TJ. Hepatitis B virus. In: Knipe DM, Howley PM, Griffin DE, Lamb RA, Martin MA, Roizman B, editors. Fields Virology. Vol 4. Lippincott-Raven Publishers; 2001. p. 2971-3036. Liang TJ. Hepatitis B: The virus and disease. Hepatology 2009;49:S13-21. Liaw YF. Natural history of chronic hepatitis B virus infection and long-term outcome under treatment. Liver Int 2009;29(Suppl 1):100-7. Lozano R, Naghavi M, Foreman K, Lim S, Shibuya K, Aboyans V, et al. Global and regional mortality from 235 causes of death for 20 age groups in 1990 and 2010: A systematic analysis for the Global Burden of Disease Study 2010. Lancet 2012;380:2095-128. Abdo AA, Abdou AM, Aljumah AA, Amir G, Bzeizi K, Dixon J, et al. A review of chronic hepatitis B epidemiology and management issues in selected countries in the Middle East. J Viral Hepat 2012;19:9-22. Alfaleh F, Alshehri S, Alansari S, Aljeffri M, Almazrou Y, Shaffi A, et al. Long-term protection of hepatitis B vaccine 18 years after vaccination. J Infect 2008;57:404-9. Al-Faleh FZ, Al-Jeffri M, Ramia S, Al-Rashed R, Arif M, Rezeig M, et al. Seroepidemiology of hepatitis B virus infection in Saudi children 8 years after a mass hepatitis B vaccination programme. J Infect 1999;38:167-70. Al-Faleh F, Ayoola E, Arif M, Ramia S, Al-Rashed R, Al-Jeffry M, et al. Seroepidemiology of hepatitis B virus infection in Saudi Arabian children: A baseline survey for mass vaccination against hepatitis B. J Infect 1992;24:197-206. Bashawri L, Fawaz N, Ahmad M, Qadi A, Almawi W. Prevalence of seromarkers of HBV and HCV among blood donors in eastern Saudi Arabia, 1998–2001. Clin Lab Haematol 2004;26:225-8. El-Hazmi MM. Prevalence of HBV, HCV, HIV-1, 2 and HTLV-I/II infections among blood donors in a teaching hospital in the Central region of Saudi Arabia. Saudi Med J 2004;25:26-33. Abdo AA, Sanai FM, Al-Faleh FZ. Epidemiology of viral hepatitis in Saudi Arabia: Are we off the hook? Saudi J Gastroenterol 2012;18:349-57. Han SH, Tran TT. Management of chronic Hepatitis B: An overview of practice guidelines for primary care providers. J Am Board Fam Med 2015;28:822-37. European Association for the Study of the Liver. EASL Clinical Practice Guidelines: Management of chronic hepatitis B. J Hepatol 2009;50:227-42. Liaw YF, Leung N, Kao JH, Piratvisuth T, Gane E, Han KH, et al. Asian-Pacific consensus statement on the management of chronic hepatitis B: A 2008 update. Hepatol Int 2008;2:263-83. Abaalkhail F, Elsiesy H, AlOmair A, Alghamdi MY, Alalwan A, AlMasri N, et al. SASLT practice guidelines for the management of hepatitis B virus. Saudi J Gastroenterol 2014;20:5-25. SOLID Registry, 2017. Available from: http://www.solid-registry.com/home. [Last accessed on 2017]. Nguyen MH, Lim J, Ozbay AB, Fraysse J, Liou I, Moore-Schiltz L, et al. Increasing age and comorbidities of chronic hepatitis B patients in the US: A longitudinal analysis of a diverse US populationbased cohort of 44,026 CHB patients over 10 years. Hepatol Int 2017;11:S193-4. Levey AS, Bosch JP, Lewis JB, Greene T, Rogers N, Roth D. A more accurate method to estimate glomerular filtration rate from serum creatinine: A new prediction equation. Modification of Diet in Renal Disease Study Group. Ann Intern Med 1999;130:461-70. Cockcroft DW, Gault MH. Prediction of creatinine clearance from serum creatinine. Nephron 1976;16:31-41. Alsuwaida AO, Farag YM, Al Sayyari AA, Mousa D, Alhejaili F, Al-Harbi A, et al. Epidemiology of chronic kidney disease in the Kingdom of Saudi Arabia (SEEK-Saudi investigators)-a pilot study. Saudi J Kidney Dis Transpl 2010;21:1066-72. Al-hamoudi W, El-Sabbah M, Ali S, Altuwaijri M, Bedewi M, Adam M, et al. Epidemiological, clinical, and biochemical characteristics of Saudi patients with nonalcoholic fatty liver disease: A hospital-based study. Ann Saudi Med 2012;32:288-92. Alswat K, Aljumah AA, Sanai FM, Abaalkhail F, Alghamdi M, Al Hamoudi WK, et al. Nonalcoholic fatty liver disease burden–Saudi Arabia and United Arab Emirates, 2017–2030. Saudi J Gastroenterol 2018;24:211-9. Stell D, Wall WJ. The impact of aging on the liver. Geriatr Aging 2003;6:36-7. Potter J, James O. Clinical features and prognosis of alcoholic liver disease in respect of advancing age. Gerontology 1987;33:380-7. Pais R, Charlotte F, Fedchuk L, Bedossa P, Lebray P, Poynard T, et al. A systematic review of follow-up biopsies reveals disease progression in patients with non-alcoholic fatty liver. J Hepatol 2013;59:550-6. Poynard T, Bedossa P, Opolon P. Natural history of liver fibrosis progression in patients with chronic hepatitis C. Lancet 1997;349:825-32. Cardoso AC, Carvalho-Filho RJ, Marcellin P. Transient elastography in chronic viral hepatitis: A critical appraisal. Gut 2011;60:759-64. Fraquelli M, Branchi F. The role of transient elastography in patients with hepatitis B viral disease. Dig Liver Dis 2011;43:S25-31. Roulot D, Costes JL, Buyck JF, Warzocha U, Gambier N, Czernichow S, et al. Transient elastography as a screening tool for liver fibrosis and cirrhosis in a community-based population aged over 45 years. Gut 2011;60:977-84. Martinot-Peignoux M, Lapalus M, Asselah T, Marcellin P. HBsAg quantification: Useful for monitoring natural history and treatment outcome. Liver Int 2014;34:97-107. Sogni P, Carrieri MP, Fontaine H, Mallet V, Vallet-Pichard A, Trabut JB, et al. The role of adherence in virological suppression in patients receiving anti-HBV analogues. Antivir Ther 2012;17:395-400.